Vancouver, BC / TheNewswire / May 11, 2018 / Global Energy Metals Corporation TSXV:GEMC | OTCQB:GBLEF | FSE:5GE1 (“Global Energy Metals”, the “Company” and/or "GEMC") is pleased to announce that the Company will be attending a number of upcoming resource and cobalt specific conferences. 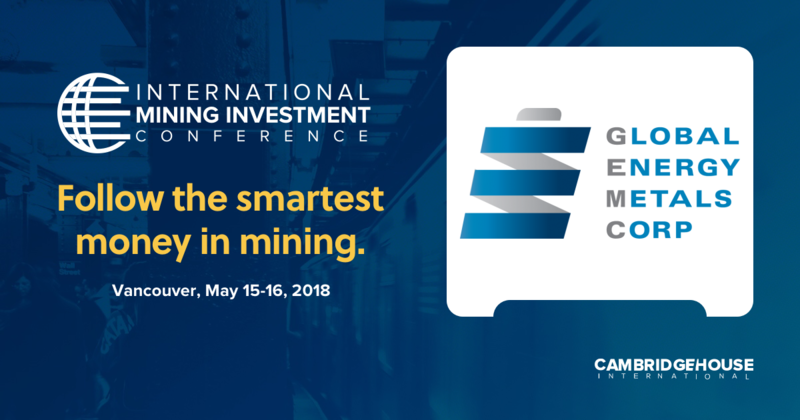 The Company will be exhibiting at the Cambridge House International Mining Investment Conference being held in Vancouver May 15-16, 2018. Company representatives will be available at booth 311 highlighting the investment opportunity Global Energy Metals presents for exposure to cobalt. With demand across most major end-use applications set to increase, and with demand from the battery sector expected to enjoy double-digit growth over the coming decade, the market is gearing itself up for a sustained period of unprecedented cobalt consumption growth. A tight market set against anticipated demand for cobalt in lithium-ion batteries has helped prices reach ten-year highs with high-grade cobalt prices as high as US$44.5/lb in late April 2018. President & CEO, Mitchell Smith will be highlighting recent achievements having successfully hit wide cobalt mineralisation in every hole at its Millennium Cobalt project along with outlining upcoming catalysts as part of the Comapny’s corporate growth strategy at 1:20pm in Workshop 3 on May 15. As announced on April 30, 2018, the Company has now received assays for three of the five holes drilled in a highly successful phase 1 drill program at the Millennium Cobalt Project (“Millennium”) located in Mt. Isa, Queensland Australia. The Company’s current campaign of drilling comprises a total of 10 diamond holes, of which the first three have now been reported. Drilling is ongoing, and the next assay results are expected to be received and reported in May 2018. Results thus far are consistent with wide and significant cobalt and copper grades intersected in previous drilling, including those holes completed in December which expanded the mineralisation envelope, aiding in increasing confidence levels of the mineralised zones within the core of the northern zone as defined by the existing JORC (2012) resource area. To date all holes in the program have intersected wide and high grade cobalt and copper material. GEMC’s management will be attending one-on-one meetings during the conference and interested parties are invited to contact the Company to arrange a meeting.